Many carpets are packed with synthetic materials and can be a source of volatile organic compounds (VOCs). These not only impact the environment whilst being produced but also the indoor air within your home. As with non-eco friendly paints the chemicals in unnatural, treated carpets will off-gas, that is emit, into the home over a period of time. There has been research into the health effects of this and it has been proven that respiratory illnesses and allergies can be aggravated by chemicals seeping out from the materials our homes are made of. When it comes to carpets there are natural alternatives but it's important to take care when researching. 100% wool carpets for example may be doused in synthetic dyes that utilize a concoction of different chemicals to produce that pretty pale pink brown. Other natural materials include coir, cotton, jute and seagrass. Ensuring the foundation or backing of the carpet is made from an eco safe material, such as natural latex, is also important as these are biodegradable and do not contain many of the carcinogenic chemicals found in traditional backing. If you're big on the DYI refurb and have decided to lay the new carpets yourself be sure to use a natural glue to fix them to the floor. Most carpets are glued with adhesives and seam sealers that are packed with VOCs. Plant-based resin and solvent free latex adhesives are your best bet. 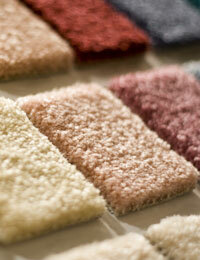 Natural, untreated carpets are not necessarily more expensive - another nice incentive. Check out the Alternative Flooring Company and Natural Carpets for some affordable options. To keep your brand new natural carpets in pristine condition don't forget to use an eco friendly carpet cleaner. There's no rest for the wicked as they say... or is that the supremely good! ?